It sounds counter intuitive, but the best way to store lights is to ball them up. Wrap five times in one direction, then turn the ball 90 degrees and repeat. Store your light balls in cardboard boxes, rather than in plastic bags: Cardboard absorbs residual moisture and extends the life of your lights. You have 27 holiday parties to attend, a nine-hour baking marathon, and oh yeah, the kids are out of school and underfoot. Here’s how to keep your home respectable with minimal trauma (and maybe even enjoy the season while you’re at it). Begin the holidays with a brain dump, listing every single itsy-bitsy, annoying task you need to handle between now and New Year’s. Taxes? Dealing with child care? Decorating your front yard? Buying gifts? Cleaning the windows? The Q4 rush back at the (sigh) office? Then, “go back through the list and remove everything that you don’t have to do,” says Massie. Great-aunt Tilda’s rosemary roll recipe always makes the house smell lovely — but who has time for all the kneading and rising in December? There’s an easy way to give your house that just-baked scent: Simmer vanilla, lemon, and thyme in a pot on the stove — no baking needed. Even better, make your sneaky simmer part of the party. Massie recommends warming something delicious in your Crock-Pot. Try mulled cider, which requires only apple cider, a few spices, and rum or brandy — if you’re feeling daring. “This will make the whole house smell good while not taking up an extra burner on the stove, and give you something delicious to enjoy,” Massie says. “Let go of putting every single toy away each night before bed,” says Didi Wong, an integrative wellness and life coach. “The kids are on vacation, and when they wake up, the fun begins all over again,” she says. So let junior relish in his freedom and scatter his toys across his room or some other designated area. That’s at least one less battle a day, right? OK, that’s stating the obvious. But sometimes you need to give yourself permission for everything to not be perfect. “Of course you want a clean home, but you don’t need to clean every closet and shelf,” says professional organizer Robyn Reynolds. Instead, focus on the places your guests will see and use. Clean hand towels in the bathroom along with a sparkling sink and toilet will give the impression your entire home has been deep-cleaned recently — even if there is a bit of dust on your coffee table. You might be a die-hard DIYer, but that doesn’t mean you have to do everything. Professional cleaners can do in a few hours what would take you days. And if you really want those lights strung outside, there are people for that, too. So maybe you spend a little less on gifts this year, but more on your family’s ability to enjoy home over the holidays. Totally worth it. Outsourcing doesn’t always have to have dollars attached. It could be teaming up with friends and family. Maybe a friend of yours who’s got that handyman knack but no baking skills will be willing to string your lights in exchange for some holiday treats you’re making anyway? That’s a win-win. It’s time to get over your holiday tree nostalgia. Sure, tromping out to the woods with dad to pick out the perfect fir was a delight, but back then, you weren’t the one who had to keep the thing watered all month and sweep up the fallen needles every night. Artificial trees come in a variety of natural-looking shapes and sizes. Or go all out with silver, gold, even fluorescent pink! Bonus: When you reuse the same tree year after year, you’re actually doing something nice for the earth (especially if you buy yours secondhand). Miss the evergreen smell? That’s what scented candles are for. If your big family dinner comes and the ham is on fire and your dog peed in the living room and little Mackenzie won’t stop banging her darn blocks against the window, don’t panic. Wonderful days have been salvaged from worse. Guests only care that you’re together. “If you approach the event with good intentions, it may not turn out to be exactly what you envisioned, but your family and guests will still thank you and be appreciative of your time and effort in putting together such a wonderfully festive get-together,” says Wong. How to prevent your pipes from freezing, even if you think they’ve already started to freeze. Getting ready to sell your home? 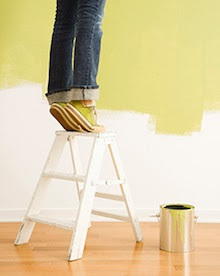 One of the easiest home improvements to get buyers’ attention is a fresh coat of paint. It’s a cost-effective fix that will make your home look updated, which can translate to increased value. Don’t Go All White or Beige. It’s true that you want to make your home appealing to the widest possible audience when you are selling, but going strictly white might make your house end up looking more utilitarian than stylish. Stick to earth tones and nature-based colors like warm browns and milky tans (think latte). Light greens and blues are classy, and warm grays are popular now. An occasional accent wall in a darker or complementary shade can also add a designer look. Take the Flooring Into Consideration. Lay color chips on the floor to see how they pair-warm tones tend to look better with most hardwood, whereas tile, terrazzo or carpet may warrant other colors. Don’t want to spend the next few weeks painting your entire home? Don’t worry – you don’t have to. Focus your painting efforts on the rooms that will have the most impact – the kitchen and baths. In the kitchen, soft buttery yellows with slight brown undertones are popular, and olive and sage greens can make it feel garden-y and fresh. Bathrooms (and the laundry room) can tolerate brighter colors because they’re smaller. Determine how much you can afford. Figure out How Much House Can You Afford? Lenders are happy to lend you as much as your debt load allows. But will that amount make you house poor? Ask yourself, how much house do I really want to afford?Read More In5 Ways You Didn’t Know You Could Save for a Down Paymenthow much house you can afford and want to afford. Lenders look for a total debt load of no more than 43% of your gross monthly income (called the debt-to-income ratio). This figure includes your future mortgage and any other debts, such as a car loan, student loan, or revolving credit cards.